Control handles are one of the features that make Visio SmartShapes, well, smart, as well as useful and fun to work with. They can be programmed to reposition text, change the sizes of margins, headers arrowheads, open and close door shapes, and much, much more. It’s not even that difficult to use them to radially position the hands of a clock! But it is not clear how to actually limit control handles to the boundary of a round clock, or to constrain them to a circle of a given radius. This article will show you how. While the technique isn’t exactly rocket science, it also not obvious. So don’t kick yourself if you have tried to do this, but come up short. Experienced ShapeSheet nerds are likely to suspect that the BOUND function can somehow be used to get control handles to stick to circles or other curves. But it isn’t quiet up to the job. The technique we’ll explore uses the ShapeSheet formulas SETATREFEXPR and SETATREF to get the job done. These formulas allow you to capture values that are set via UI elements such as control handles, then redirect them to other cells for further processing. They also allow you to ignore the input values in favor of recalculated values. 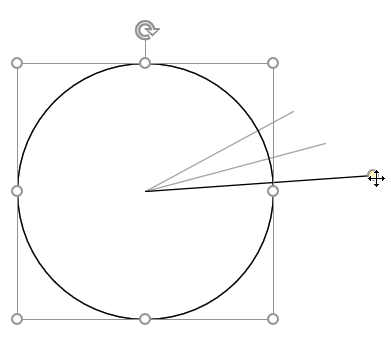 These characteristics allow you to take the position of a control handle as a user manipulates it, calculate the nearest point on a circle, then override the mouse-position to force the control handle on to the circle. Note that I’ve changed the row types in the line’s geometry section from RelMoveTo and RelLineTo to the old-fashioned MoveTo and LineTo row types. This is simply a matter of right-clicking anywhere in the ShapeSheet, choosing Insert Section…, then checking the appropriate boxes. It’s fairly easy trigonometry to get the line to end at the edge of the circle, regardless of the position of the control handle, but it leaves the user feeling that the system is a bit sloppy. Ideally, we would want the handle to stay on the perimeter of the circle. We’ll fill in the formulas later. The system we’re going to use involves user-defined cells, along with two functions: SETATREFEXPR and SETATREF. Let’s start with the former. What the function SETATREFEXPR() does is store a value or formula, which usually comes from the user interface. This function is usually used in cells such as Width, Height, Angle, or Control Handles. 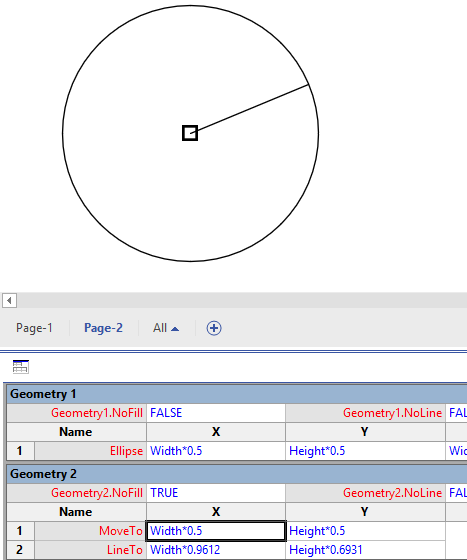 When a user alters a shape via the UI, Visio stuffs an expression into the the parentheses of SETATREFEXPR( some_ui_expression ). 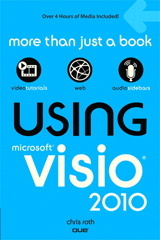 Furthermore, Visio doesn’t destroy any other parts of the formula for that cell. So that’s interesting! With this setup, we can add terms to each formula. We could round the values. We could multiply them by 0, then add the COS() of DAYOFYEAR() of NOW(). Or we could try doing something useful instead. While intriguing, SETATREFEXPR isn’t enough in its own right. We need one more piece: SETATREF. And go tug on your control handle in the drawing window. Notice the two user cells as you move the control handle: they’re receiving the same bits that get stuffed into the SETATREFEXPR() functions! So if you look at our empty user cells, you can see what’s in store. We’re going to use the pushed x and y values to calculate the angle at which the control handle is positioned, relative to the center of the circle, then we are going to calculate a point on the circle at that angle. The final task will be to feed that calculation back to the control handle. This is the same as multiplying the whole thing by zero. Now, when you move the control handle, the SETATRERFEXPR( ) values will update. The User-UI_CHX/Y formulas will update, but the radial line will remain pointing at the point (0, 0). So it seems we’ve broken the whole thing, but we’re actually quite close. So let’s take the User.UI_CHX/Y values and calculate and angle and a point. User.Ang will use the ATAN2( dy, dx ) function to calculate the angle, relative to the center of the shape, which is located at ( Width*0.5, Height*0.5 ). Once we have an angle, we can calculate a point on the perimeter. Note that Visio has a PNT( x-val, y-val ) function that actually returns a point structure with x and y values! To pick off individual components, use the PNTX() and PNTY() functions. Some special ShapeSheet cells will do this for you automatically–namely X and Y cells in geometry, control handle, and scratch sections. But when a point is part of a larger formula, you will need to use PNTX or PNTY to get the part of the point that you need.